Healthy and Durable Porcelain, Non-Toxic and Harmless, Longer Using Time. Can Withstand Extremes of Low & High Temperature, Microwave and Dishwasher Safe. 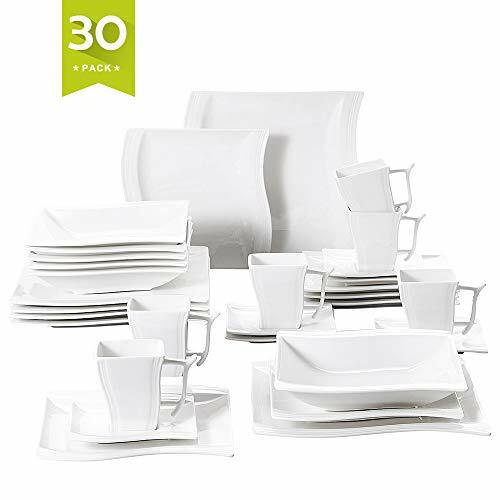 Perfect 30-Piece Cream White Dinner Combi-Set to Meet Your Different Needs for 6. Great for Home, Restaurants and Cafés Use. Ideal for Daily Use or Festival Decoration. PREMIUM QUALITY – Compared to disposable tableware, the porcelain dinnerware righted weight, sturdy, eco-friendly, which means giving you and your family a more healthy life. Smooth still sturdy, safe for daily use. Minimalist Design – Designers bring the natural elements of the fine into inspiration, with simple and smooth lines, concise design easily matches existing dinnerware in a kitchen. Simple style design easily matches with existing flatware, beautiful and elegance will be in kitchen. RICH PACKAGING: This Dinnerware set including 6 each: 10.25 inch dinner plate, 8.25 inch dessert plates, 8.25 inch soup plates, 4 inch cup and 5.5 inch saucer. Elegant and timeless dinnerware for those special occasions when you dress your dinner table to perfection, yet always suitable for everyday use. Easy to Clean – Fired in High Temperature, unmatched Thermal Resistance From -65F to 500F, Not Easy to Be Broken. Perfectly compatible with many cold & hot food without worry about chips, nicks, cracks, and scratches. Our outstanding dinnerware set can be cleaned easily and safely in the dishwasher, and you can use them directly in the microwave. Perfect After-Sale Service – We guarantee you’ll love this wonderful product. If you receive any broken or chipped items, feel free contact us, professional team will solve problems you are experiencing, promise you will have no loss.